Remember Bleed? We sure do. 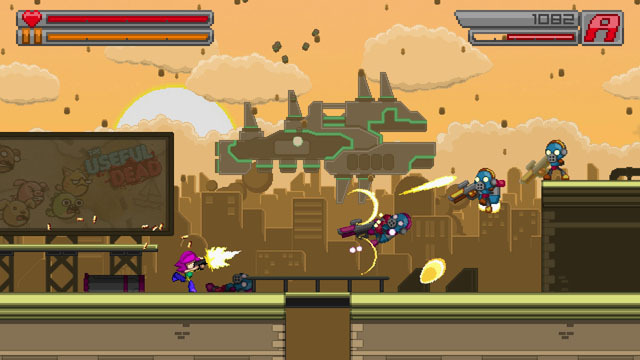 Bleed was a stylish acrobatic shooter starring a purple-haired heroine named Wryn. Well, Bootdisk Revolution hasn't forgotten either, and now they're following up with a sequel entitled - you guessed it - Bleed 2. Wryn wryturns... ahem, returns... and she's more agile than ever, dashing through the air with her pistol and energy blade, wrecking shop on gun-wielding freaks and looking sharp doing it. The wry Wryn wrecks wrongdoers with reckless abandon as she deflects bullets, leaps across flying missiles, and curves between incoming projectiles while aiming shooty death in their direction. In addition to the high-flying action, the game features dozens of bosses, unlockable weapons, and new playable characters, as well as 2P local co-op. Bleed 2 is coming to PC, Mac, and Linux via Steam at the end of this year or the beginning of next.